Yesterday (January 29, 2003), the Japan Times revealed a story that now becomes stage one of Japan's worst nightmares. The etiology of Mad Cow Disease in Japan has been traced to a milk-based feed given to dairy cows. 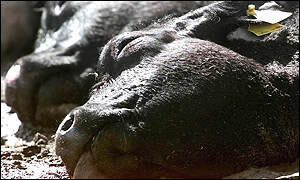 The infectious protein fibril (prion) responsible for Mad Cow Disease may have an incubation period of up to 40 years. Japan now waits for the human form to appear in their population, just as it did in Great Britain. This news should come as no surprise. After all, milk is actually white blood, and scientists suspect that blood transmits Mad Cow Disease. In order to insure the safety of America's blood supply, the Food and drug Administration now prohibits the giving of blood in America if the donor has lived in England for 3 months or more. FDA scientists recognize that blood is a means of transmission. So is milk. That has now been confirmed. Each day, a typical dairy cow filters 10,000 liters of her own blood through her udder. The udder captures blood cells and other blood proteins. In 2002, the average liter of milk sold in America contained 322 million dead white blood cells. 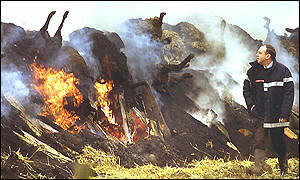 In 1997, during the middle of England's Mad Cow Disease panic, many British meat eaters turned vegetarian. On August 23, 1997, the London Times revealed that a 24-year-old vegetarian had been diagnosed with Cruetzfeld-Jacob Disease, the human form of Mad Cow Disease. Scientists believed that milk or cheese was the source of infection. "The destruction of milk from suspected cows was recommended in England to insure the public's safety... Experiments also indicate that temperatures reached during pasteurization of milk and household cooking does not kill the agent. In the United Kingdom on December 1, 1988 the government announced a ban on the sale of milk from infected cattle..."
"The outbreak of bovine spongiform encephalopathy (Mad Cow Disease) has had major impacts on the United Kingdom dairy industry, including the loss of beef from dairy markets, the culling of more than 900,000 dairy bull calves, the removal of all cattle more than 30 months of age from the human food chain, and now slaughter of cohort animals. Impacts on dairy marketing have yet to be properly assessed."